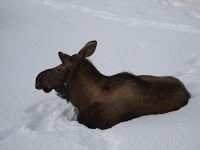 Another moose took the afternoon off and rested in Camai B&B’s backyard. 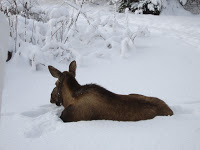 She was extremely comfortable and calm as she was lying down in the fresh snow chewing her cud. Our backyard has been designated as a wild-life friendly place. Currently all of Camai Bed and Breakfast suites are booked. One of the families staying with us has a young four-year-old son who is extremely well-mannered. This young person wants to see moose. As things go, the child was not here this afternoon. Probably he is forming much better memories than seeing the moose. He is visiting his great-grandmother with his parents and grandparents. Great-grandmother is living in a near-by nursing home. I am posting these moose pictures for him! All the child will be able to see tonight is the indentations in the snow where the moose was. Camai Bed and Breakfast is very conveniently located near several assisted living facilities and nursing homes. From time to time we have guests stay with us while they are in Anchorage to visit family members in one of the facilities.